Buy 6-11 Seachem Additives and receive a 5% discount. Seachem Acid Buffer is a non-phosphate buffer to lower pH and buffer with Alkaline Buffer. Both buffers are designed for the planted aquarium or for very hard water where phosphate buffers may pose an algae or cloudiness problem. Acid Buffer lowers pH and buffers between 5.0 and 8.0 when used with Alkaline Buffer. As Acid Buffer lowers pH it converts carbonate alkalinity (KH) into available CO2. It may also be used to safely lower pH in marine water. To lower pH, use 2 g (1⁄4 teaspoon) to every 80 L (20 gallons*) daily until intended pH is reached (this dose lowers alkalinity by about 0.2 meq/L (0.6 dKH)). Best if added directly to aquarium. Seachem Acid Regulator, 250 gm, adjusts pH to the acidic range (4.5–5.5) and softens water by precipitating calcium and magnesium. Acid Regulator supports the establishment of the optimal environment for all acid acclimated species (e.g. neons and other tetras, etc.). For further freshwater environment enhancement, use Fresh Trace to restore the proper level of trace elements and feed NutriDiet Tropical Flakes for thriving, healthy freshwater community fish. Use 1 level teaspoon (5 g) for every 40 L (10 US gallons) daily until intended pH is reached. For precise dosing use the Seachem Digital Spoon Scale. Thereafter, use once a month or with water changes as required to maintain pH. To raise pH, use Neutral Regulator. To target a particular pH use in combination with Neutral Regulator following the chart. This chart assumes the use of unbuffered water (RO or DI). If water is already buffered use the chart as a starting guide. Use Prime to dechlorinate tap water before doing a water change. Seachem’s Brackish Salt, 300 gm, is a chemically sound blend of salts designed to replicate the native environment of live bearers and other brackish estuary fish without adversely impacting aquatic plants when used at regionally specific recommended dosage. The salt is also well suited for routine aquarium freshwater use. It does not impact pH or provide buffering. Unlike other aquarium salts currently available to the hobbyist, Brackish Salt is more than just a simple sodium chloride product. These other salts can burn leaves and roots in a planted aquarium. However, Brackish Salt does not cause this type of damage, and actually provides many nutrients crucial to healthy plant growth. Dosing of Brackish Salt allows for specific duplication of different brackish water environments found worldwide (such as the waters of Sumatra or the waters of Borneo). Brackish Salt can also be dosed for general brackish water community aquariums and general freshwater community aquarium. Brackish Salt is a safe and effective alternative to the sodium chloride based aquarium salts so prevalent. Seachem’s Brackish Salt, 600 gm, is a chemically sound blend of salts designed to replicate the native environment of live bearers and other brackish estuary fish without adversely impacting aquatic plants when used at regionally specific recommended dosage. The salt is also well suited for routine aquarium freshwater use. It does not impact pH or provide buffering. Seachem Cichlid Lake Salt, 500 gm, is a chemically sound blend of salts designed to replicate the natural environment of Rift Lake African Cichlids. It contains all physiologically essential elements such as magnesium, calcium, sodium, potassium, and includes trace components such as iron, aluminum, and iodide. Although the major Rift Lakes contain basically the same mineral salts, they do so in greatly differing concentrations. Cichlid Lake Salt is formulated so that dosages vary depending on the lake of origin and need only be added when setting up an aquarium or with water changes. Many competing products are little more than combinations of Epsom salt and bicarbonate of soda. This will not provide a complete replication of the mineral salts that are contained in the lakes of Africa, in particular calcium and potassium. Seachem’s Tanganyika Buffer (pH 9.0–9.4) and Malawi/Victoria Buffer (pH 7.8–8.4) should be used to adjust carbonate hardness and pH. Seachem Cichlid Trace, 250 ml, supplies a broad range of trace elements demonstrated* to be necessary for proper ﬁsh health and growth. Unlike terrestrial animals, fish obtain nutrients from both their food and environment. Trace elements are normally depleted by utilization, oxidation and precipitation, thus it is important to restore them on a regular basis. Cichlid Trace contains only those elements actually demonstrated to be required by fish. Seachem Cichlid Trace, 500 ml, supplies a broad range of trace elements demonstrated to be necessary for proper ﬁsh health and growth. Unlike terrestrial animals, fish obtain nutrients from both their food and environment. Trace elements are normally depleted by utilization, oxidation and precipitation, thus it is important to restore them on a regular basis. Cichlid Trace contains only those elements actually demonstrated* to be required by fish. Seachem Clarity is the ultimate clarifier for both fresh and saltwater. It employs an advanced polymeric flocculating agent that is both reef and plant safe. Clarity is the only clarifier on the market that does it all. Clarity will clear all types of clouding including, but not limited to, chemical clouding and particulate clouding (i.e. stirred up gravel bed). Use one capful for every 20 gallons. The entire 250 ml bottle will treat 1,000 gallons. Use one capful for every 40 gallons. The entire 4 Liter bottle will treat 16,000 gallons. Use one capful for every 20 gallons. The entire 500 ml bottle will treat 2,000 gallons. Seachem Discus Buffer helps to replicate the ideal Discus environment (low pH & low GH (General Hardness)). Discus Buffer will lower pH and keep it lowered. Discus Buffer also softens water by precipitating calcium and magnesium. Use 1 level teaspoon (7 g) for every 10-20 gallons daily until intended pH is reached. Thereafter, use once a month or with water changes as required to maintain pH. Seachem Discus Trace, 250 ml, supplies a broad range of trace elements demonstrated* to be necessary for proper fish health and growth. Unlike terrestrial animals, fish obtain nutrients from both their food and environment. Trace elements are normally depleted by utilization, oxidation and precipitation, thus it is important to restore them on a regular basis. Discus Trace contains only those elements actually demonstrated* to be required by fish. Aquarium salt is often used to add salts back to aquarium water. Some fish will tolerate this therapeutic use of salt; however, some fish are less tolerant. Discus as a species will not tolerate this elevated level of sodium in the water. If you keep live plants in your discus aquarium, the plants will not tolerate this either. Discus Trace is a well rounded trace mineral supplement that does not contain sodium and is used to replenish trace and ultra trace minerals that are demonstrated to be necessary for fish health and growth. Seachem Discus Trace, 500 ml, supplies a broad range of trace elements demonstrated to be necessary for proper fish health and growth. Unlike terrestrial animals, fish obtain nutrients from both their food and environment. Trace elements are normally depleted by utilization, oxidation and precipitation, thus it is important to restore them on a regular basis. Discus Trace contains only those elements actually demonstrated to be required by fish. Seachem Equilibrium is specifically designed to establish the ideal mineral content for the planted aquarium. Equilibrium contains no sodium or chloride (which can be detrimental to a planted aquarium at elevated levels). Equilibrium is ideally suited for use with RO (reverse osmosis) or DI (deionized) water or any mineral deficient water. Equilibrium raises the essential mineral/electrolyte content (General Hardness) of the water to balance with and promote stability of the carbonate hardness. To raise mineral content/general hardness (GH) by 1 meq/L (3 dH), add 16 g (1 tablespoon) for every 20 gallons when setting up an aquarium or when making water changes (add to new water). Seachem Flourish Advance is an all-natural, biologic growth enhancer for aquatic plants. Its advanced formula contains phytohormones, minerals, and nutrients that dramatically stimulate the growth of both roots and shoots in aquatic plants. Phytohormones are a group of naturally occurring compounds that play crucial roles in regulating plant growth in a wide range of developmental processes, including cell division, formation and activity of shoot meristems, induction of photosynthesis gene expression, leaf senescence, nutrient mobilization, seed germination, root growth and stress response. Used regularly, it also enhances mineral absorption and improves disease resistance. It is non-toxic and completely safe for all plant varieties as well as for fish and aquatic organisms. During the first ten to fourteen days after application, Flourish Advance works to stimulate root growth beneath the surface. After this initial induction period, significantly enhanced growth in the leaves and stems of the plants will occur. On initial use or after a water change use one capful for every 20 gallons. Thereafter use one capful for every 100 gallons. The entire 2 liter bottle will treat 400 gallons for 1-2 months. Use one capful for every 50 gallons every day or every other day. The entire 250 ml bottle will treat 50 gallons for 1-2 months. Seachem Flourish Excel is a source of bioavailable organic carbon. All plants require a source of carbon. This is typically obtained from CO2, but, may also be derived from simple organic compounds (such as photosynthetic intermediates). The use of either CO2 injection or Flourish Excel does not necessarily negate the use of the other. Because the processes of producing photosynthetic intermediates and building onto them occur simultaneously, one can derive a substantial benefit with the use of Flourish Excel either alone or in conjunction with CO2. The combination is particularly ideal for situations when continuing to add CO2 could result in dangerously low pH levels. Flourish Excel also has iron reducing properties which promote the ferrous state of iron, which is more easily utilized by plants than ferric iron. On initial use or after a water change use one capful for every 20 gallons. Thereafter use one capful for every 100 gallons. The entire 4 liter bottle will treat 800 gallons for 1-2 months. Use one capful for every 50 gallons every day or every other day. The entire 500 ml bottle will treat 100 gallons for 1-2 months. Seachem Flourish Iron is a highly concentrated (10,000 mg/L) ferrous iron (Fe+2) gluconate supplement. It should be used in those cases where the iron requirements exceed that which can be delivered by Seachem Flourish at the recommended dose or signs of iron deficiency appear (such as short and slender stems or yellowing between veins.) Contains no phosphate or nitrate. Use 1 capful (10 ml) for each 100 gallons or as required to maintain about 0.10 mg/L iron. Use the Seachem MultiTest Iron Test Kit to monitor iron concentrations.This 2 liter size treats 400 gallons for 1-2 months. Use 1 capful (5 ml) for each 50 gallons or as required to maintain about 0.10 mg/L iron. For smaller doses please note that each cap thread is about 1 ml. Use the Seachem MultiTest Iron Test Kit to monitor iron concentrations.This 250 ml size treats 50 gallons for 4-6 months. Use 1 capful (5 ml) for each 50 gallons or as required to maintain about 0.10 mg/L iron. For smaller doses please note that each cap thread is about 1 ml. Use the Seachem MultiTest Iron Test Kit to monitor iron concentrations.This 500 ml size treats 100 gallons for 4-6 months. Nitrogen is one of the main three macro nutrients (nitrogen, phosphorus, potassium: NPK) required by plants and can often become the limiting factor to growth in a flourishing system. Seachem Flourish Nitrogen, 1 liter, is a concentrated (15,000 mg/L) blend of nitrogen sources. It provides nitrogen in both the nitrate form and the plant–preferred ammonium form. However, no free ammonia is released because the ammonium in Flourish Nitrogen is complexed and unavailable until utilized by the plants. Flourish Nitrogen also provides nitrate for those plants that can readily utilize nitrate as well. For maximum benefit, use with Flourish Phosphorus and Flourish Potassium. Flourish Nitrogen is safe for invertebrates such as shrimp. Nitrogen is one of the main three macro nutrients (nitrogen, phosphorus, potassium: NPK) required by plants and can often become the limiting factor to growth in a flourishing system. Seachem Flourish Nitrogen, 250 ml, is a concentrated (15,000 mg/L) blend of nitrogen sources. It provides nitrogen in both the nitrate form and the plant–preferred ammonium form. However, no free ammonia is released because the ammonium in Flourish Nitrogen is complexed and unavailable until utilized by the plants. Flourish Nitrogen also provides nitrate for those plants that can readily utilize nitrate as well. For maximum benefit, use with Flourish Phosphorus and Flourish Potassium. Flourish Nitrogen is safe for invertebrates such as shrimp. Nitrogen is one of the main three macro nutrients (nitrogen, phosphorus, potassium: NPK) required by plants and can often become the limiting factor to growth in a flourishing system. Seachem Flourish Nitrogen, 500 ml, is a concentrated (15,000 mg/L) blend of nitrogen sources. It provides nitrogen in both the nitrate form and the plant–preferred ammonium form. However, no free ammonia is released because the ammonium in Flourish Nitrogen is complexed and unavailable until utilized by the plants. Flourish Nitrogen also provides nitrate for those plants that can readily utilize nitrate as well. For maximum benefit, use with Flourish Phosphorus and Flourish Potassium. Flourish Nitrogen is safe for invertebrates such as shrimp. Seachem Flourish Phosphorus, 2 liter, is one of the main three macro nutrients (nitrogen, phosphorous, potassium: NPK) required by plants and can often become the limiting factor to growth in a flourishing system. Flourish Phosphorus is a safe solution (4,500 mg/L phosphate) of potassium phosphate that takes the guess work out of phosphate dosing. Unlike competing products that mix nitrate and phosphate in a fixed ratio, Flourish Phosphorus (being nitrate free) allows you to dose phosphorus according to the needs of your plants without the risk of overdosing nitrates. When used as directed, Flourish Phosphorus will enhance and accelerate the growth of aquatic plants without enhancing algae growth. For maximum benefit, use with Flourish Nitrogen and Flourish Potassium. Flourish Phosphorus is safe for invertebrates such as shrimp. Seachem Flourish Phosphorus, 250 ml, is one of the main three macro nutrients (nitrogen, phosphorous, potassium: NPK) required by plants and can often become the limiting factor to growth in a flourishing system. Flourish Phosphorus is a safe solution (4,500 mg/L phosphate) of potassium phosphate that takes the guess work out of phosphate dosing. Unlike competing products that mix nitrate and phosphate in a fixed ratio, Flourish Phosphorus (being nitrate free) allows you to dose phosphorus according to the needs of your plants without the risk of overdosing nitrates. When used as directed, Flourish Phosphorus will enhance and accelerate the growth of aquatic plants without enhancing algae growth. For maximum benefit, use with Flourish Nitrogen and Flourish Potassium. Flourish Phosphorus is safe for invertebrates such as shrimp. Seachem Flourish Phosphorus, 500 ml, is one of the main three macro nutrients (nitrogen, phosphorous, potassium: NPK) required by plants and can often become the limiting factor to growth in a flourishing system. Flourish Phosphorus is a safe solution (4,500 mg/L phosphate) of potassium phosphate that takes the guess work out of phosphate dosing. Unlike competing products that mix nitrate and phosphate in a fixed ratio, Flourish Phosphorus (being nitrate free) allows you to dose phosphorus according to the needs of your plants without the risk of overdosing nitrates. When used as directed, Flourish Phosphorus will enhance and accelerate the growth of aquatic plants without enhancing algae growth. For maximum benefit, use with Flourish Nitrogen and Flourish Potassium. Flourish Phosphorus is safe for invertebrates such as shrimp. Seachem Flourish Potassium, 2 liters, contains 50,000 mg/L of potassium suitable for the natural planted aquarium. Potassium is one of several elements that are vitally important to maintaining a vigorous level of growth in a planted aquarium. Potassium can become depleted in a rapidly growing system or when the source water has a low mineral content. In these cases potassium could become the limiting factor to growth. Use Flourish Potassium™ to prevent potassium depletion (signs of which include yellowing in older leaves) and maintain the highest level of growth. Seachem Flourish Potassium, 250 ml, contains 50,000 mg/L of potassium suitable for the natural planted aquarium. Potassium is one of several elements that are vitally important to maintaining a vigorous level of growth in a planted aquarium. Potassium can become depleted in a rapidly growing system or when the source water has a low mineral content. In these cases potassium could become the limiting factor to growth. Use Flourish Potassium™ to prevent potassium depletion (signs of which include yellowing in older leaves) and maintain the highest level of growth. Seachem Flourish Potassium, 500 ml, contains 50,000 mg/L of potassium suitable for the natural planted aquarium. Potassium is one of several elements that are vitally important to maintaining a vigorous level of growth in a planted aquarium. Potassium can become depleted in a rapidly growing system or when the source water has a low mineral content. In these cases potassium could become the limiting factor to growth. Use Flourish Potassium to prevent potassium depletion (signs of which include yellowing in older leaves) and maintain the highest level of growth. Seachem Flourish Tabs are growth stimulating tablets for plant roots. They contain essential trace elements, amino acids, and vitamins. They are rich in iron, manganese, magnesium, calcium, potassium, inositol, choline B12, biotin, and other factors that have been determined to be beneficial to aquatic plant roots. 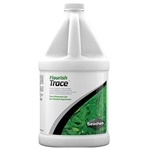 Seachem Flourish Trace supplies a broad range of trace elements demonstrated to be necessary for proper plant health and growth. Trace elements are normally depleted by utilization, oxidation and precipitation. The latter two processes occur more rapidly than with other micronutrients. This makes it important to restore trace elements on a regular basis. Flourish Trace is safe for invertebrates such as shrimp. Use 1 capful (5 mL) for every 80 L (20 US gallons) twice a week. When using in conjunction with Flourish, dose on alternate days. Seachem Flourish, 2 liter, is a comprehensive plant supplement for the natural freshwater aquarium. It contains a rich assortment of important micro elements, trace elements and other nutrients. These include calcium, magnesium, iron and other important elements that have been shown to be beneficial to aquatic plants. Use one capful for every 60 gallons once or twice a week. The entire 2 liter bottle will treat 800 gallons for 4-6 months. Seachem Flourish is a comprehensive plant supplement for the natural freshwater aquarium. It contains a rich assortment of important micro elements, trace elements and other nutrients. These include calcium, magnesium, iron and other important elements that have been shown to be beneficial to aquatic plants. Use one capful for every 60 gallons once or twice a week. The entire 250 ml bottle will treat 100 gallons for 4-6 months. Use one capful for every 60 gallons once or twice a week. The entire 500 ml bottle will treat 200 gallons for 4-6 months.